Best tablets to buy in 2015 | What Hi-Fi? Whether you're after a cheap tablet or something a little more premium, we've done the necessary tablet reviews to help you make the right buying decision. Apple and Samsung may steal most of the headlines but do the iPad and Galaxy tablets justify the hype? Or is it worth considering a budget tablet like the Tesco Hudl 2? 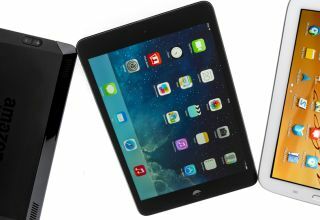 2014 saw plenty of good tablets, from impressive Windows tablets to super-cheap budget tablets and even viable supermarket special alternatives. And we're sure there will be plenty more new additions in 2015, starting at CES this month. Read on to see our pick of the best tablets you can buy and should be considering if you're in the market for a tablet right now. We've split our choices by size - the best 10in tablet and the best 7in tablet (or thereabouts) - and given you a few others worthy of your consideration in to the bargain. Click through to read the full reviews on each products, see pictures, tech specs and compare the latest live prices. The iPad Air was crowned our Product of the Year in the tablets category at the What Hi-Fi? Awards 2014 and remains a great tablet (and possibly the best option for many people) but the iPad Air 2 is simply the best tablet you can buy. Apple's new flagship tablet made good on its promises to deliver "the best tablet display you've ever seen", at the same time as measuring up as the thinnest tablet on the market. Faster, more powerful and with Touch ID, it offers a stunning performance, excellent screen and unrivalled user experience. That’s a combination of superlatives that you simply won’t get anywhere else. The latest tablet offering from Sony is a vast improvement over the old Sony Xperia Tablet Z. An incredibly thin frame that makes the iPad look chunky and a fantastic screen come together into one desirable package. It's waterproof, too, should you like getting wet and wild with your tablet. Sound quality is good, though ultimately not quite as detailed as the iPad, while video is solid but bettered by the Google Nexus 10’s crisp screen and great battery life. It's pricier, too. Still, if you're a Sony fan, like the design, and value the waterproof design, then the Xperia Tablet Z2 might just be the best tablet for you. Offering a good few quid saving on the new iPad, it’s hard not to be impressed with the Nexus 10. Video is superb and music isn’t far behind, while the interface, features and content offerings are thorough. The build could have a little more sparkle and we await more tablet-specific app offerings but the Nexus 10 is undoutbtedly a serious alternative for a 10in tablet. The laptop and tablet hybrid may have been made most famous by the Asus Transformer Pad Infinity but we rather like this Dell XPS 10 tablet, which can also be paired with an optional keyboard. On its own, the Windows 8 Start interface is a colourful, customisable pleasure, using the Windows RT rather than Windows Pro OS to good effect but meaning you can't install full Windows programs but can use the Windows 8 app store. A 1366 x 768 10.1in screen looks detailed, natural and realistic – though of course it's a shame it's not full HD – but the sound can be a little on the light side. Not perfect but an appealing alternative to the usual suspects. Two years on the trot the Google Nexus 7 (the latest, 2013 Nexus) has taken our Award for the best compact tablet. One of the first tablets to show you can combine great performance in a compact package with a price tag under £200. It's slim and light but durable, has plenty of apps, and sports neat features such as multiple user profiles (something we've still yet to see on the iPad). Sound quality is impressive for a tablet, even (surprisingly) from the stereo speakers, while the screen delivers video with good detail and impressive colours, avoiding the over-saturated tendencies of cheaper tablets. It's all capped-off by a respectable nine-hour battery life. If you want an affordable 7in tablet, then we think the Nexus 7 is still the best option. The iPad Mini 3 is a bit of a tricky one to judge. In many respects, it’s last year’s tablet with a few non-essential tweaks that come at an £80 premium compared to the iPad Mini 2, which remains on sale. But while there’s no doubt the iPad Mini 2 now represents good value, and is certainly worth considering, the iPad Mini 3 still manages to more than hold its own against its 2014 rivals. It’s as strong in video and audio as ever, and packs a level of design and performance you can’t argue with. Apple’s iPad Mini 3 might not have got the upgrade memo, but when you’re already this good, do you really need it? The Kindle Fire HD combines all of Amazon's content offerings in to one simple tablet. Using Amazon's rather than Google's app store, it's an easy to use offering that's ideal for regular Amazon shoppers. A 7in, 1280 x 800 screen delivers lovely pictures with good contrast and detail, while sound quality – even from the speakers – is full-bodied and punchy. It might not offer the full-fat Google Android experience, but for simplicity of use – and if you're a big Amazon ebook, MP3 or movie fan – it's a winner. It might just be the best tablet for kids for that reason. An ever-decreasing price tag (seemingly) means the Galaxy Tab 2 7.0 remains one for the shortlist (even if the likes of the Samsung Galaxy Note 8.0 are around the corner). The chassis is plastic but we still prefer the design to the likes of the Kobo Arcand Kindle Fire HD, while the Android 4.0 experience is smoother and more complete here. Video is good, while music is a little more run-of-the-mill, but for a price below £200, this Android tablet becomes far more competitive. You'd be forgiven for thinking Samsung has a new tablet out every week and the Galaxy range certainly sees plenty of coming and going. The Tab S is now Samsung's flagship tablet, and it's available in 8.4in and 10.5in versions. We reviewed the smaller model and were largely impressed with what we saw. The Galaxy Tab S 8.4 is certainly the best tablet we’ve seen from Samsung, and it’s up there as one of the best Android tablets we’ve tested - but it does fall short when compared to the iPad Mini 2 for pure audio and video performance. The Sony Xperia Z3 Tablet Compact is an excellent addition to the Z3 family, offering a great video experience, a superb way with music and a startlingly good battery life – all wrapped up in a slim and stylish shell. While its name might be a bit of a mouthful, this tablet’s performance more than speaks for itself, and we really like what it’s saying. The Tesco Hudl surprised us by delivering an impressive level of performance for a low price, making for a fine budget tablet that was easy to recommend for anyone wanting a simple, no-frills tablet. The Hudl 2 screen is larger, up from 7 to 8.3 inches, and is now full HD. The overall build quality is better, too. There's only 16GB storage but the SDcard slot allows you to add more, while an HDMI output is a nice addition for connecting to your TV. As for performance, it's still a fine budget tablet. It won't match the best on the market for audio purists, nor is the picture class-leading, but for basic functionality or if you're prepared to be a little less discerning over performance (video is decent, audio average) for the money you save, then it's still hard to argue with the Hudl.